I’ve discovered a few apps thanks to blog and forum posts here on AndroidPIT. Floating Image is one of these apps, and I’m glad someone recommended it to me. Why is that? Find out in today’s test review. Floating image is no ordinary image gallery. It lets pictures sail by; clicking on a picture enlarges it, whilst the other pictures continue to float by in the background. 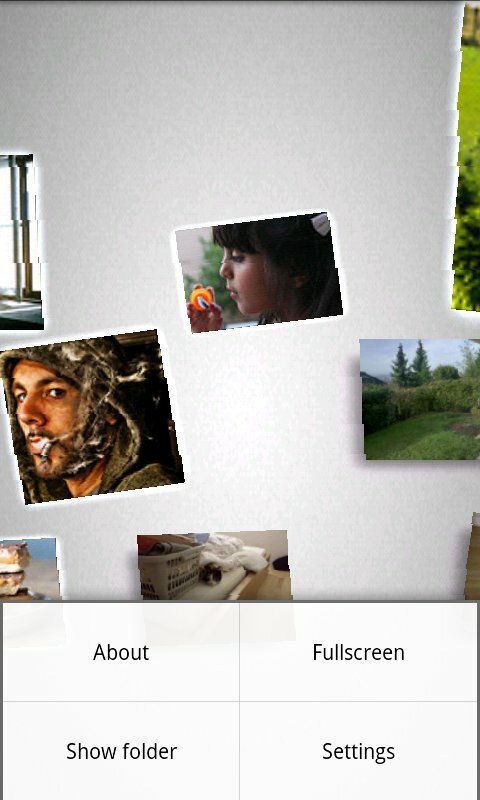 You can determine the folders from which pictures are shown, but also choose images from other, individual folders. Until you deactivate this folder, only pictures taken from this folder will be shown. 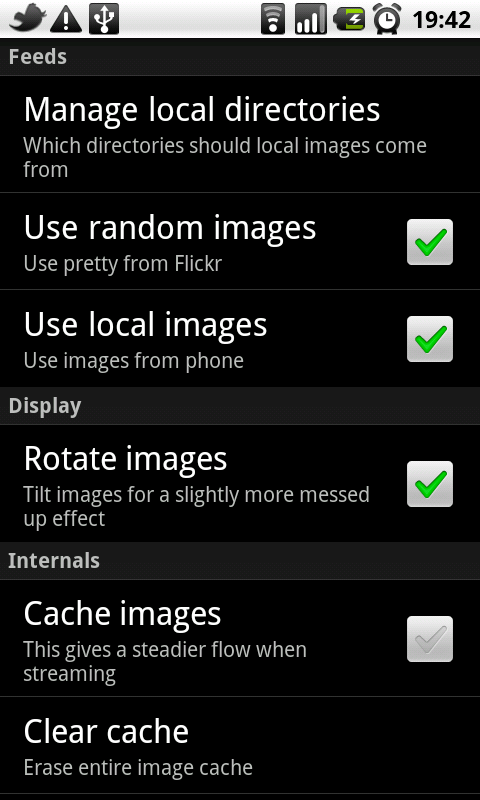 Aside from viewing images from your memory card, you can also select photos randomly from Flickr. Hence, Floating Image is best suited for browsing, rather than looking at photos in the “normal” fashion. And that’s what’s really fun about Floating Image. That being said, there were a few things I felt to be missing from this app, and that you may miss, too—e.g. it isn’t possible to zoom in or forward images. This is only possible to a certain point, and only crabwise. You’ll find more info in the “Screen & Controls” section. 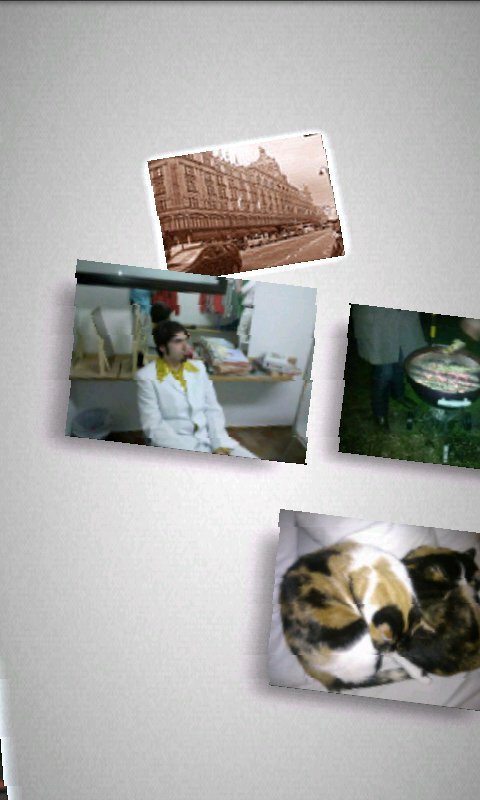 Floating Image is still quite a nice app—let’s hope it’ll be developed further. As soon as you start Floating Image, pictures start sailing by at moderate speed, from left to right. You can influence the speed and the direction the images are floating in by using your finger and sliding it to the right or left on the display. If you click on “Show” you can access and browse through your SD card via an Explorer, and make it so that only images from this folder are shown. In order to do so you have to press the folder you want for a long time and then press “select folder”. Once you’ve chosen a folder, the option “Show” turns into “Cancel Show”; that way you can deactivate said folder. If you click on one of the pictures floating by it’s displayed in big. As I mentioned earlier, it isn’t possible to zoom in or forward pictures within Floating Image itself, but you can make it work by pressing on the image you want for a long time and the selecting “go to source”. Of course, this hinges on what kind of device you’re using, as well as which other image apps you’ve installed on your phone. When I tested this using the G1 I wound up in the standard gallery straight away (where it is possible to zoom in and forward), whereas the Nexus One gave me a choice between Astro Image Viewer, Gallery and Photo BURST. The standard Nexus One Gallery wasn’t able to display the image, and neither was Photo BURST. Only Astro Image Viewer was able to open the image I’d selected, as well as allow me to forward it. It wasn’t possible to zoom in, though. Despite the fact that there are a few downsides to Floating Image, it is, nonetheless, a different kind of photo album, which is what makes it so appealing. Especially the optics – the fact that the images literally float by – is quite something. That being said, I’m not (yet) awarding it an A (4 stars)… Here’s hoping that the app will continue to improve, that we can upgrade it’s score at some point. Floating Image runs smoothly and fluidly, even on a G1. The only problems occurred with the Nexus One Gallery. Floating Image doesn’t seem to get along with it. 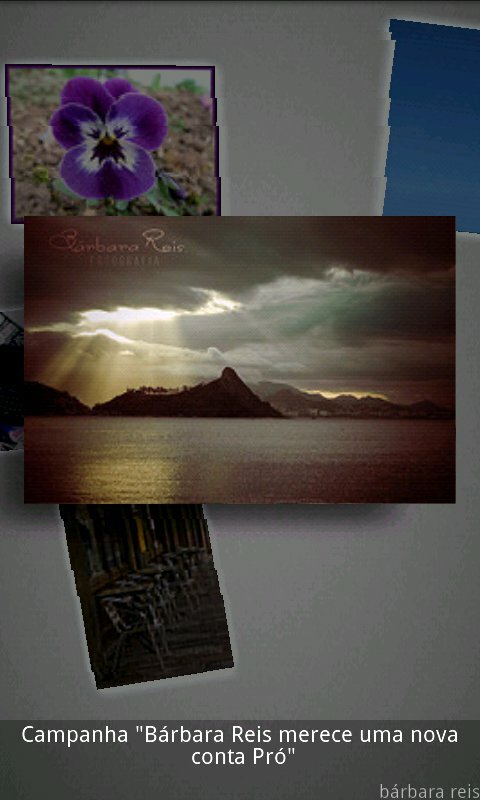 Floating Image can be downloaded for free from the Android Market. It seems to be an interesting application. Oh, no. No one can dis this program. This is the ONLY existing alternative to Apple TV's floating picture screensaver. Unlike other junk in the Play store, this mines ALL your photos (thousands), floats a mess of them at any one time on the screen, and with a touch lets you zoom and focus on any one that you want. If you have thousands of pics over a lifetime, THIS IS THE ONLY program that makes sense for 'flipping through' them. Upon getting a large android tablet some day, I plan to put this sucker on, have hi res thumbnails, use Tsunami mode, and then hang it on a wall to watch a nonstop display of several pics at a time floating by, just like flipping through a photo album...but better. Think of it, how many digital pics do you have? How often do you look at ANY of them? Hang a digital tablet on a wall with this program, and you can be viewing memory lane 24/7. It's insane how this program is buried and unrecognized, AND FREE. Good to know that there can be issues with clearing cache on some models, thanks Bill! Constantly clearing image cache, unable to set my pics as wallpaper. Other than that, it's good.